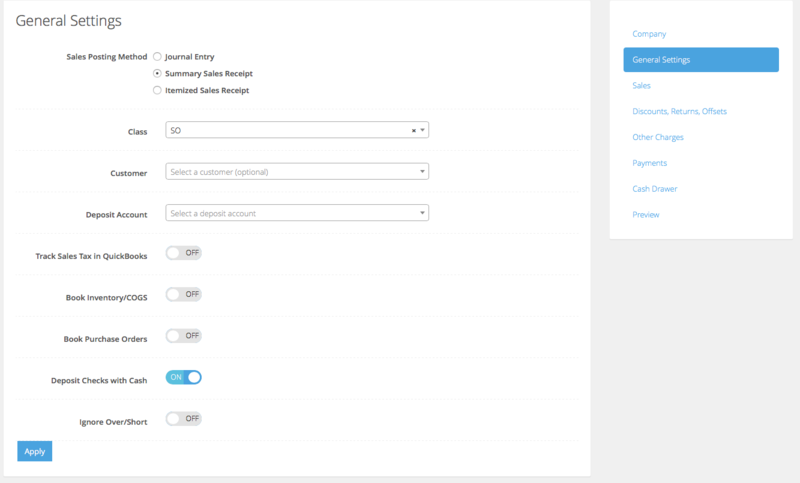 Creates a single journal entry with the sales grouped based on the point of sale department or category, as per Lightspeed’s naming convention. Creates a sales receipt (net-to-cash) with sales grouped by category. Creates a single Sales Receipt (net-to-cash) based on the Lightspeed item (SKU/PLU). The individual options are as follows and will vary. Customer Only applies for Sales Receipts and optionally allows you to associate the Lightspeed Accounting posting with a QuickBooks Customer. NOTE: Lightspeed Accounting integration is not based on each point of sale transaction, so this customer can be something like Walk-In or Point of Sale, not an individual customer who purchased a product or service. Deposit Account Only applies to Sales Receipts. Unlike a QuickBooks Invoice, Sales Receipts will create a net balance which will represent the amount of the cash deposit, which will be recorded into this Deposit Account. This will, typically, be a Cash on Hand account, the Undeposited Funds account, or (not recommended) an actual bank account. Track Sales Tax in QuickBooks If this is checked, Lightspeed Accounting use the sales tax rates as defined in QuickBooks, allowing you to match the point of sale tax rates with QuickBooks. You can also optionally specify a non-taxable rate, if applicable. Book Inventory/COGS Creates a journal entry representing Inventory and Cost of Goods Sold offset value amounts based on products sold net of returns. Inventory and COGS accounts are specified at the category level. Please note that this option is a value based not a quantity based integration. For example, Lightspeed Accounting will post the cost of how much was sold not how many. If you are applying your vendor invoices directly to a COGS account in QuickBooks as you are paying your bills, you do not want to enable this option as it will result in duplicate COGS amounts as well as reduce an Inventory Asset account balance that does not exist. Book Purchase Orders Currently not available for Lightspeed Restaurant. Deposit Checks with Cash If you deposit checks together with your cash in the same deposit, as recorded on your bank statement, this option will group all cash and check tenders processed on a given date on the point of sale into one amount to facilitate matching with the actual bank deposit. Ignore Over/Short Depending on your operations, you can select to ignore any over/short reported by your point of sale and instead book the expected cash amount. This is most often used when the merchant knows that the cashiers will frequently not close the drawer properly.